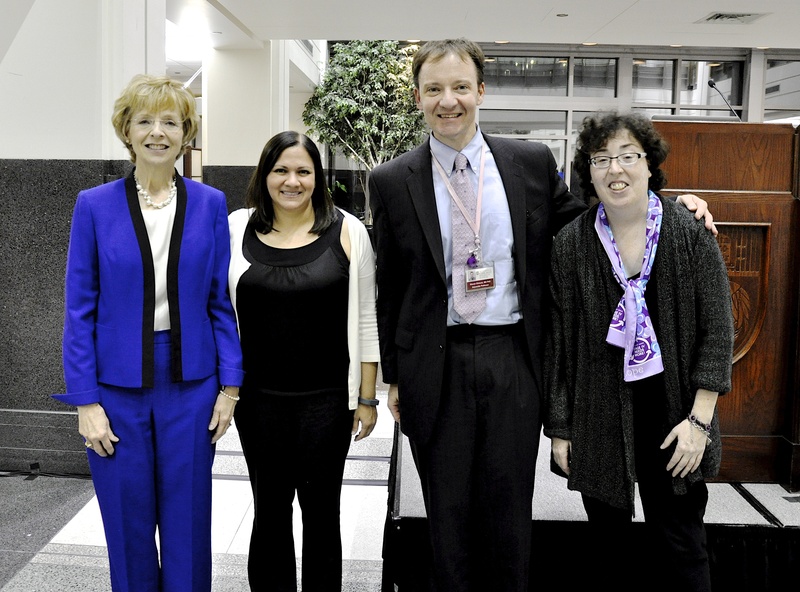 MBCN’s Shirley Mertz (left) and Katherine O’Brien (far right) with leadership award recipients Dr. Nanda and Dr. Chmura. At a Metastatic Breast Cancer Forum held by the University of Chicago Medicine Comprehensive Cancer Center on October 27, 2015, patients and caregivers heard from two University of Chicago clinicians, oncologist Dr. Rita Nanda and radiation oncologist Dr. Steven Chmura, who shared current and new approaches aimed at improving treatment outcomes for women who live with metastatic breast cancer, a currently incurable, but treatable form of breast cancer that ends the lives of 110 people every day and 40,000 lives annually in the United States. At the conclusion of the presentations, Shirley Mertz, a metastatic breast cancer patient, and President of the Metastatic Breast Cancer Network (MBCN), an all-volunteer, non-profit, nationwide patient-led organization, noted that although metastatic breast cancer is responsible for virtually all breast cancer deaths, a recent analysis revealed that only seven percent of all government and privately funded grants from 2000-2013 focused on improving outcomes for those living with metastatic breast cancer. Breast cancer remains the second leading cause of cancer death for women in the US, and it is the leading cause of cancer death for women globally. “We know research holds the key to changing those statistics,” said Mertz. Mertz then announced that MBCN wants to support the ongoing research of Dr. Rita Nanda and Dr. Steven Chmura by presenting an MBCN Research Leadership Award to each in the amount of $30,000. Mertz said that the awards are made possible from contributions sent to MBCN from individuals, families and work colleagues who want to honor or remember loved ones, colleagues, and friends with metastatic breast cancer. The Metastatic Breast Cancer Network, a national, not-for-profit organization, was founded in 2004 to raise awareness about the kind of breast cancer that is rarely discussed in the breast cancer support groups or the media—metastatic breast cancer. Unlike early stage breast cancer, in which cancer cells are confined to the breast, in metastatic breast cancer, cancer cells have traveled from the breast to other sites in the body. Led by patient advocates, MBCN has worked to offer education and information to patients and their caregivers through its website (mbcn.org); targeted brochures developed for the public and those newly diagnosed; and an annual conference for metastatic patients at major comprehensive cancer centers.